Jawbone Flats Cafe | Where friends meet and smiles are free. Where friends meet and smiles are free. Jawbone Flats Cafe isn't just a place to get a good meal; it's where friends meet to swap stories. Ken and Deb were living in Seattle with the dream of relocating to the LC Valley where Deb grew up. They jumped at the opportunity to purchase Tom Smith's in 2001 and for the past 18 years, the Antles have prided themselves on serving high quality, homemade meals to their diners. Ken brings more than 40 years of restaurant experience to Jawbone Flats. From their roasted meats and gravies to Ken's popular soups, you'll be glad you came in. 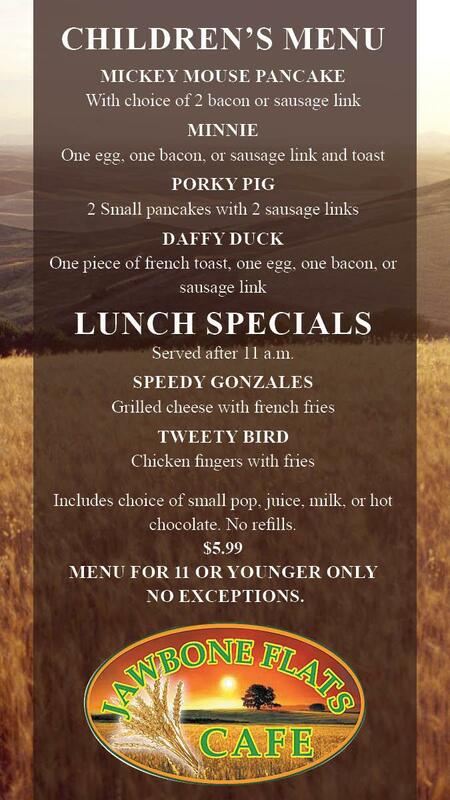 Breakfast is served all day and you don't want to miss out on the daily specials. There is also a large meeting room in the back available for banquets or large groups of up to 40. Come in and enjoy the warm atmosphere; you won't be sorry!